There are 4 types of food coloring: liquid, gel, paste, powder, and natural ingredients. Which should you use? Personalize! Choose colors for cookies for holidays, to fit an occasion like a wedding or graduation, or to coordinate with a theme, such as your favorite team’s colors. If you choose to combine food colors that you have on hand to make a new shade (like yellow and red to make orange), do so in a small bowl with a toothpick before adding it to the dough. This way you can control the tint. Start by adding small amounts of coloring to the cookie dough and adjust as a you go. 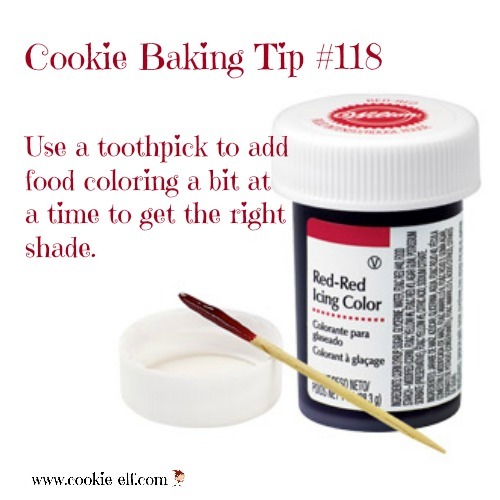 You can always add more to make the color deeper, but you cannot remove extra coloring once it is mixed into the dough. Use a toothpick! Blend the coloring into the cookie dough using a slow speed with an electric mixer, a mixer paddle attachment with a standing mixer, or by kneading it in by hand. Stop to check the color after the first addition. If it is too light, add more color a bit at a time until the dough is the color you want. Before I started “getting colorful” by using food coloring in cookie dough, I always thought I needed to mix the dough and then add color as the final step before rolling it to make cut-out sugar cookies or loading it into the cookie press to make press cookies. That works! But so do other options. I discovered you can add coloring to the wet ingredients. For instance, stir in orange color to melted mixture before adding cereal to make Halloween Rice Krispie Treats. Food coloring can stain your skin. Try using food service gloves to protect your hands (they’re also available in kids’ sizes.) Or you can wash your stained hands with water and then wipe them gently with a washcloth blotted in white vinegar. If stains persist, then use baking soda to make a paste to wash your hands and remove stains.